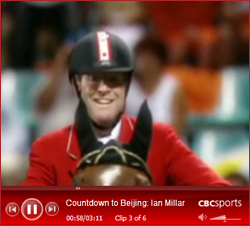 CBC’s Olympic tv program, Countdown to Beijing, this week featured quite a touching profile on Ian Millar. Ian talks about his participation in 8 previous Olymic Games (9 if you count the boycotted Games in 1980) as well as the loss of his biggest fan & supporter, his wife Lynn Millar. The Globe & Mail features an article profiling Captain Canada. Ian talks about his experience at past Olympic Games, and why he is still hungry for success after all these year.